So, you’re pregnant! You know what you should be eating, both for your health and that soon-to-be baby’s: leafy greens, anything orange (no, anything naturally orange), the leanest meat. But how to get all those things into your diet is a whole other story. Fortunately, many of these foods are all over the farmers market in the fall, and with the right recipes, you can fill up on them easily and deliciously. 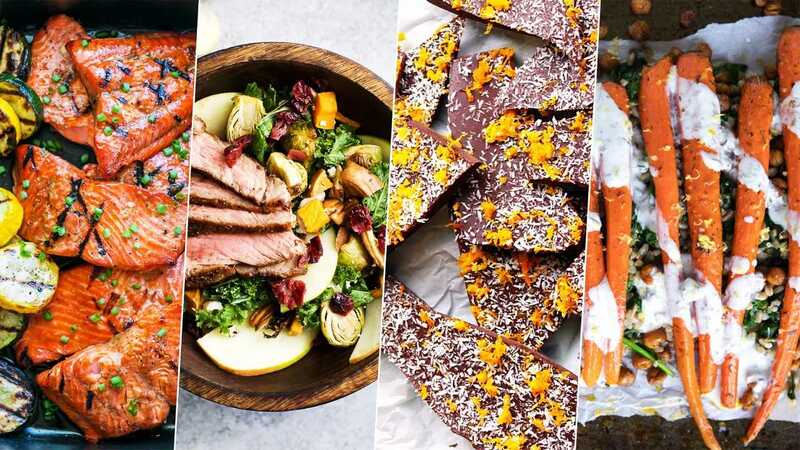 From a harvest salad topped with steak and apple cider vinaigrette to pan-roasted butternut squash with spinach and Parmesan, ahead are seven recipes that will make wish you could stay pregnant forever. Or, maybe just wish it could stay fall forever? Yeah, fall forever. 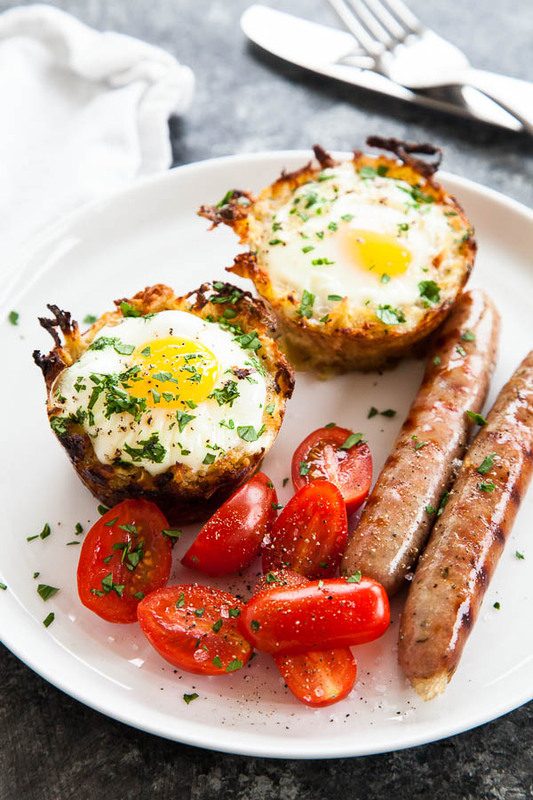 With sweet potatoes (vitamin A), eggs (protein) and Parmesan cheese (calcium), these easy-to-make-ahead nests from Breakfast for Dinner are a triple threat of pregnancy superfoods. 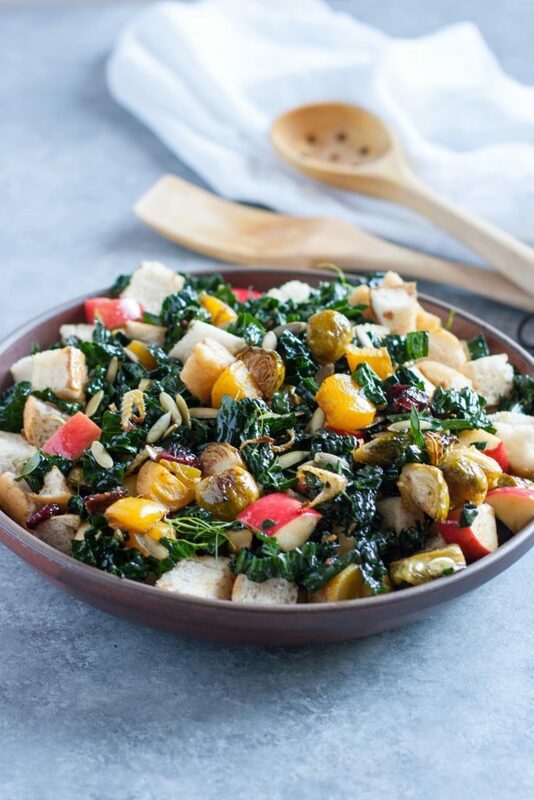 A not-too-virtuous salad from Kate Kasbee at Well Vegan, this panzanella breaks up the cruciferous kale and Brussels sprouts with soft Italian bread — not a pregnancy food, just a life food — with gala apples and dried cranberries for a meal that’s packed with fiber, folate, potassium and vitamins A, B6, C and K.
Low in mercury, salmon is one of the most pregnancy-safe fish, though try to eat wild Alaska-caught salmon if you can. 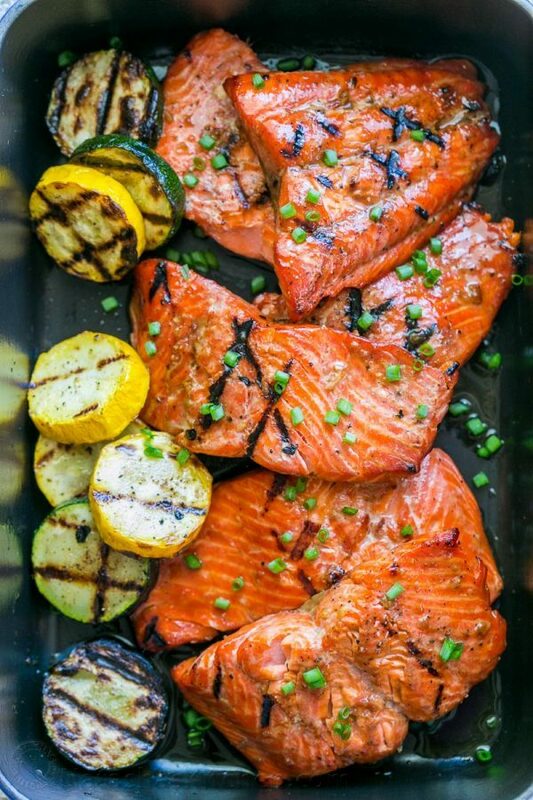 This grilled salmon from Natasha’s Kitchen hints at fall with a maple-soy marinade, and when grilled to perfection, it is a simple way to load up on B vitamins and omega-3 fatty acids. 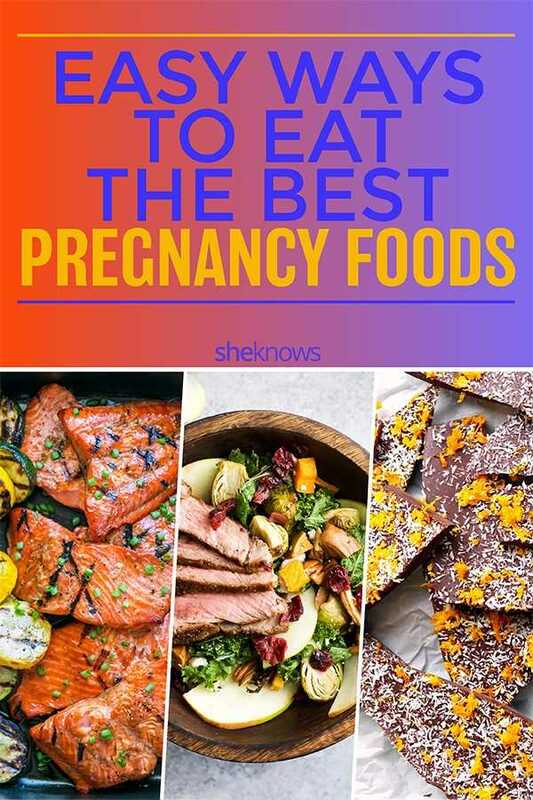 Don’t think chocolate is a pregnancy food? 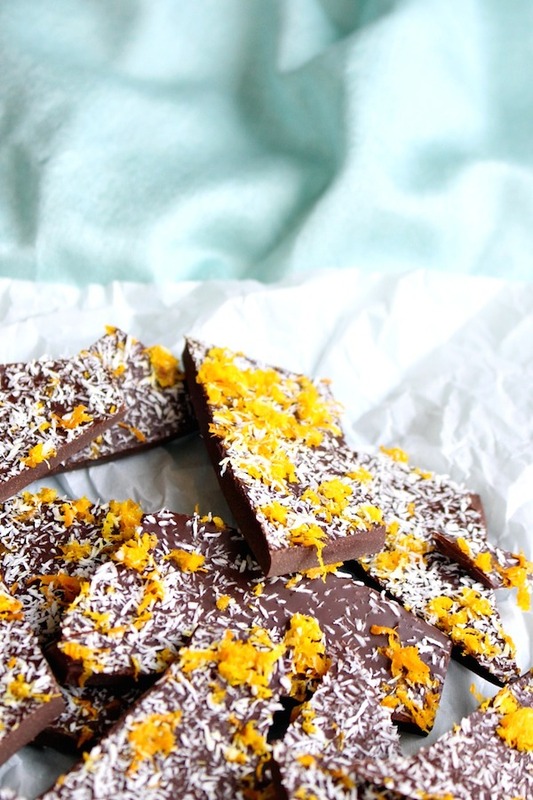 It’s been shown to reduce the risk of preeclampsia, and this chocolate-orange bark from Dans Le Lakehouse is topped with shredded coconut and orange zest for an extra dose of vitamin C, iron and fiber. A lean cut of steak (try eye-round sirloin tip) counts for the lean meat you’re supposed to eat so much of while pregnant, and it’s packed with iron, B vitamins and, of course, protein. 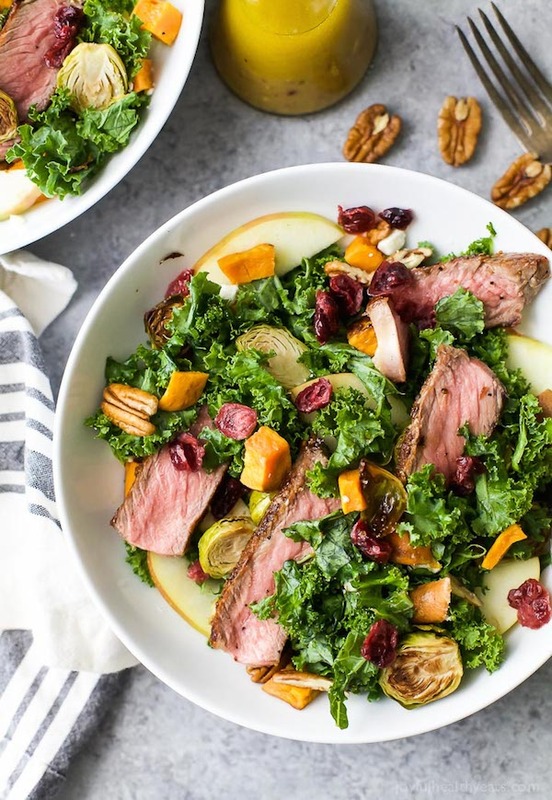 This fall salad from Joyful Healthy Eats ups the ante with other vitamin- and nutrient-rich kale, Brussels sprouts, sweet potatoes, pecans, apples, dried cranberries and crumbled feta (just make sure it’s pasteurized). 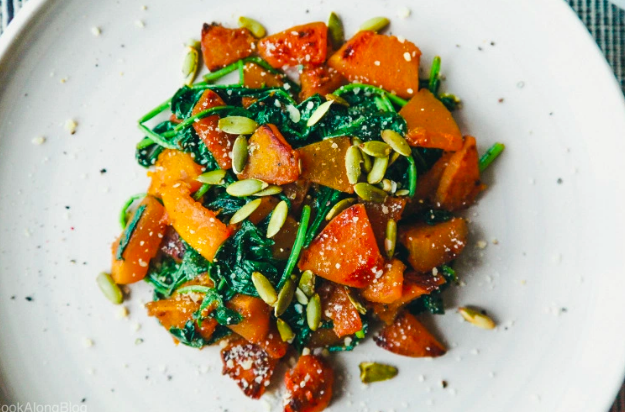 Orange and green vegetables unite to create this side dish from CookAlongBlog. This means it’s chock-full of vitamins A, B6 and C, plus a fair amount of calcium, potassium, iron and magnesium. There is no ingredient that is not pulling its weight in this side from Coffee & Crayons. 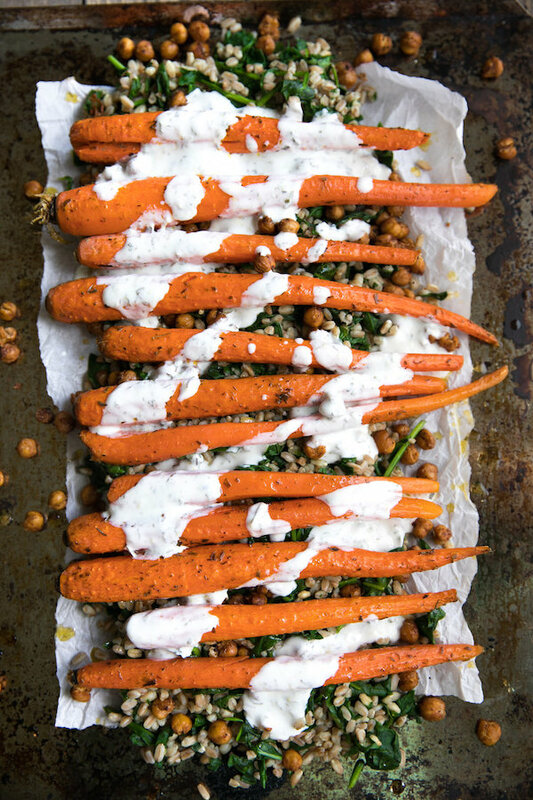 The carrots and spinach hold it down for vegetables, while chickpeas bring in the plant-based protein, yogurt adds some calcium and B vitamins, and farro — besides being a whole grain rich in fiber and protein — is a good source of niacin, magnesium, zinc and iron.